Should You Invest In What's Currently Popular? Let’s have a psychology discussion today. We’re going to analyze your propensity to want to invest in what is popular. While we’re sure that you can find many blogs telling you not to invest in things just because they are currently popular – stocks, real estate, whatever – we want to touch on the emotions that investing can induce, especially in times of volatility – and especially for those of us who try to ‘beat’ the market’s returns. If everyone else wore clothes to work, would you? If everyone else ate food or inhaled oxygen, would you? Those examples are exaggerated for effect, but it can sometimes be hard to tease out what is just good sense – like breathing or wearing clothes – and what is just an unnecessary fad… like buying housing in 2006. Like those signs hanging in your second grade class reminding you that “What is popular is not always right – and what is right is not always popular” – so, too, goes the investing game. The problem that investors so often face while first settling on an investing psychology boils down to the phrase “misery loves company“. It’s much easier to go through a shock if you believe you are experiencing that shock with everyone else. You get the idea – it is psychologically easier to admit you got caught up in a mania, or were influences by some powers beyond your control than to admit that, hey – maybe some of your results might have had at least 1% to do with your behavior. There is no rule which states that you need to sell your stocks when they drop 40-50%, nor is there a rule that you should go on debt fueled car buying binges and charge vacations to credit cards when times are good. 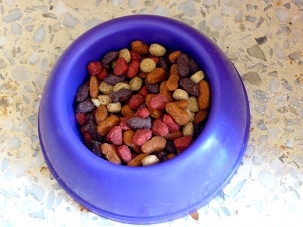 A picture of a bowl of dog food from Morgue File. The problem with trying to Keep Up With The Joneses, is, of course, not knowing exactly what the Joneses are doing. Understanding your propensity to search for a higher power to blame when times are bad can help you to adjust things when times aren’t so bad – and since this is a finance site, let’s talk about that now. If you find yourself writing comments like the two linked above, or have found yourself blaming circumstances for your investing failings, there is really only one path to take – you need to “set it and forget it” when it comes to your investments. That might mean investing in a target date fund, it might mean assembling a portfolio of broad index funds – but it doesn’t mean to try your luck in individual securities. Success in investing is such a rare thing that many folks will argue that it doesn’t actually exist and is just a statistical aberration. But, assuming that it does exist (and let me tell you, I’m one who assumes that it does, even if it is rare) – you need to appraise your own psychology before chasing alpha down the negative return hole. Good investing would require contrarianism – and the willingness to stand tall in your appraisal of the markets even when everyone else is saying the opposite thing. In fact… especially when everyone else is saying the opposite thing. That might mean responding to people who have explicitly called you out for your hypothesis – remember, you first have to be the only one to go somewhere before others can follow. So, are you willing to continue to insist the emperor has no clothes – even if it takes months or years for other people to admit it? Think hard before saying “yes” – the vast majority of us should just buy index and target date funds and not even look at the emperor to form an opinion. Investing in what is popular can suddenly leave you feeling mighty naked.